For those that watch their calories, and try to reduce sugar from their diet, ice cream likely isn’t on the menu. There are some reduced sugar creams on the market, but lack the taste, until now. 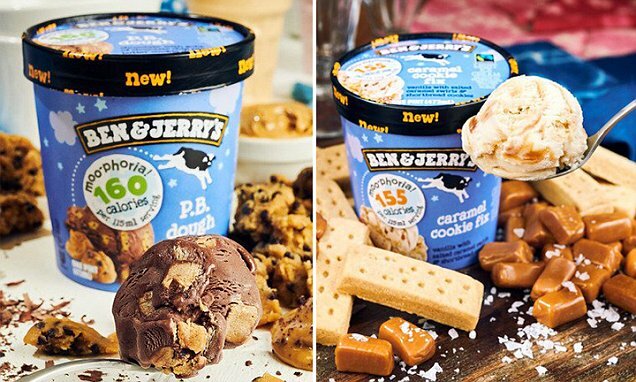 Ben & Jerry’s in Australia (and hopefully soon globally) is out with a new line of ice cream: Moo-Phoria, which is 45% lower in fat, and has 35% fewer calories than traditional ice creams. Plus the line does not use sugar alcohols or sugar substitutes. The tasty treats include Chocolate Cookie Affair (150 calories per serving), Caramel Cookie Fix, (155 calories per serving) and PB Dough, a decadent dessert featuring light vanilla ice cream with gobs of chocolate chip peanut butter cookie dough. The company launched the new flavours in the US and the UK in February, and according to a press release, the range has been a ‘huge success’.